Florida’s Department of Agriculture and Consumer Services recently recognized the success of Riverview High School’s program Stars to Starfish, which features eco-friendly aquaculture (fish farming) technology made possible through a multi-year partnership with Mote Marine Laboratory scientists. Teaching the next generation about aquaculture is critical. The U.S., imports 91 percent of its seafood, leading to a $10 billion trade deficit. At the same time, saltwater fishing in Florida generates an estimated $6.1 billion in revenues annually. Mote Aquaculture Research Park in eastern Sarasota County is addressing new ways to clean and re-use both fresh and salt-water in closed-loop, or recirculating, systems, to grow fish, sea vegetables and plants for wetlands restoration in ways that sustainably utilize natural resources –– especially water. Mote scientists are excited to share their knowledge with the next generation at Riverview High School. Riverview’s Stars to Starfish program provides field trips for students in kindergarten through eighth grade. 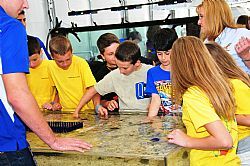 High school students in their second year of marine science courses teach over 4,000 elementary and middle school students from their Sarasota school district annually. Field trip participants begin each tour at Riverview’s planetarium, where visitors watch a 20-minute, Riverview-created planetarium show titled “Stars to Starfish." Next, student interns accompany each group to the “Aquadome," Riverview High School’s 32-by-72-foot aquaculture facility. Here students are led through a wide variety of exhibits, including a visiting snook and shark tank, a touch tank with saltwater invertebrates, a clownfish reproduction system, a coral propagation tank and a productive aquaponics system. Each exhibit emphasizes environmental sustainability while also covering content pertinent to Next Generation Science Standards. The field trip is an enriching experience for both guests and student tour guides, who passionately discuss their projects and promote aquaculture and marine conservation to younger students.